This cosmopolitan venue offers its guests ideal holidays. 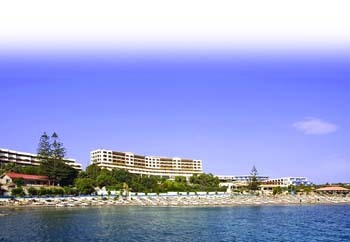 Only 6 km away from the medieval town of Rhodes, is a luxury resort just by the Aegean Sea. The combination of luxurious accommodation, superb service, live entertainment, sports and activities lends a creative and pleasant character to all business meetings and conferences. 587 air conditioned guestrooms, family rooms, studios and suites of excellent interior design and modern, luxurious amenities. Main Restaurant: Chinese Restaurant, children's restaurant; a la carte restaurant beach and snack bar and restaurant, Greek Tavern restaurant. Main bar with panoramic view: cocktail bar; pool bar; disco/night club; boutiques; mini-market; coiffure salon; games room; large-screen-IV & DVD room; bridge room. Seven large outdoor swimming pools; 1 indoor heated pool, 2 children's outdoor pools, giant waterslide (80 meters long,); tennis courts: Golf court (10 km away from the hotel); fitness centre, sauna. Turkish bath. jacuzzi. massage services; water-sports centre: diving and tennis school; playground. Recreation and athletic activity programmes under the guidance of the multilingual qualified animation team at the mini-club. Corporate meetings, conferences and incentives hosted in the state-of-the-art Paradise Mare Conference Centre (consisting of two spacious Conference Halls with breakout rooms) that caters for groups of up to 800. The centre provides complete audio visual equipment, simultaneous translation system and the latest in professional event support services and facilities.